Lovely views out over the Crocodile River where you’ll often spot herds of elephant and a myriad other game coming down to drink! The game viewing in the Mjejane reserve is ever-improving (remember animals are free to roam across the river between Mjejane and Kruger) – and if you feel like going into Kruger instead then book a spot on the lodge’s 4X4 which is able to cross over the private bridge into the national park. The Luxury Rooms are very attractive and enjoy prime views of the river – if available they’re an inexpensive upgrade that’s a real no-brainer as far as we’re concerned. Relax in the pool with an ice-cold drink and watch the wildlife come to you – no need for long game drives when you can just recline by the pool and watch herds of elephant and other game drinking whilst warthogs graze on the lodge lawns. Enjoying sundowners whilst out on game drive at one of the many picturesque spots along the Crocodile river – a cold beer seldom tastes as good as this! 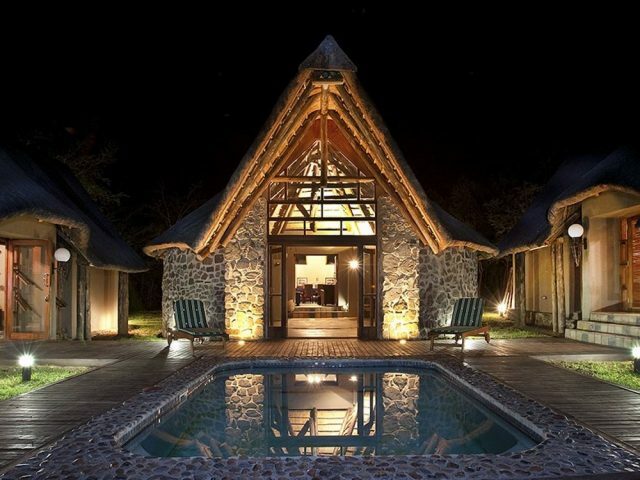 The “hotel in the bush” style and feel may not suit some people looking for more traditional game lodge architecture and style. Sitting on a private residential game reserve fenced into the Kruger National Park, Mjejane River Lodge is a best-of-both worlds place. While it offers many of the benefits of the private concession game lodges deeper inside the reserve bring in abundance, Mjejane balances its wild appeal with modern hotel-style comfort and great value for money – giving you more bang for your buck whilst still offering much of the safari experience. Walk out onto the deck at Mjejane River Lodge and your pulse will no doubt quicken at the fantastic views of the Crocodile River in front of you with the endless bush of the Kruger Park stretching beyond. 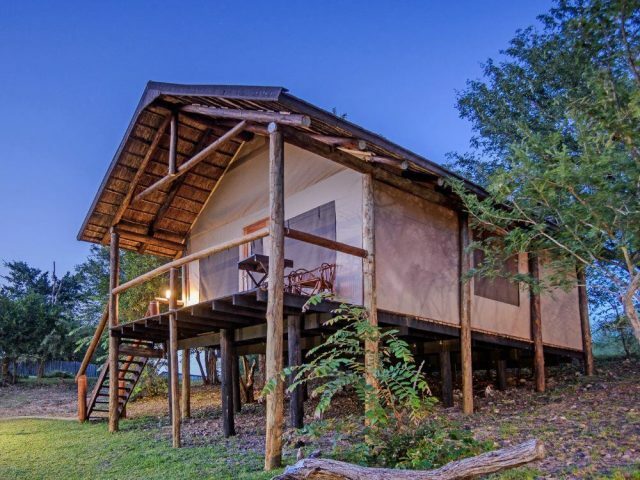 Unlike many similar lodges which lie just outside the official borders of the Kruger Park however, in the case of the Mjejane reserve there are no fences separating the 2 reserves and game is free to roam back and forth across the river between the 2 pieces of land. This means that the game viewing on the Mjejane reserve has become increasingly consistent, but Mjejane has another ace up its sleeve: an exclusive agreement with the Park’s authorities has seen a bridge being constructed over the river, allowing the lodge’s 4X4 vehicles to pass over to go viewing on the vast expanse of roads in the Kruger itself (this option to go into the park comes at an extra cost but does avoid having to drive and enter through one of the official public gates) Many guests however, simply choose to do all their game activities in the Mjejane reserve itself, especially given that Big Five sightings are increasingly common. As mentioned previously the style of both the main public buildings and the rooms eschew the traditional game lodge style of thatched roofs and loads of natural stone and wood – rather the look and feel is more of a generic modern hotel (which is not going to appeal to some people looking for a more traditional game lodge type atmosphere). 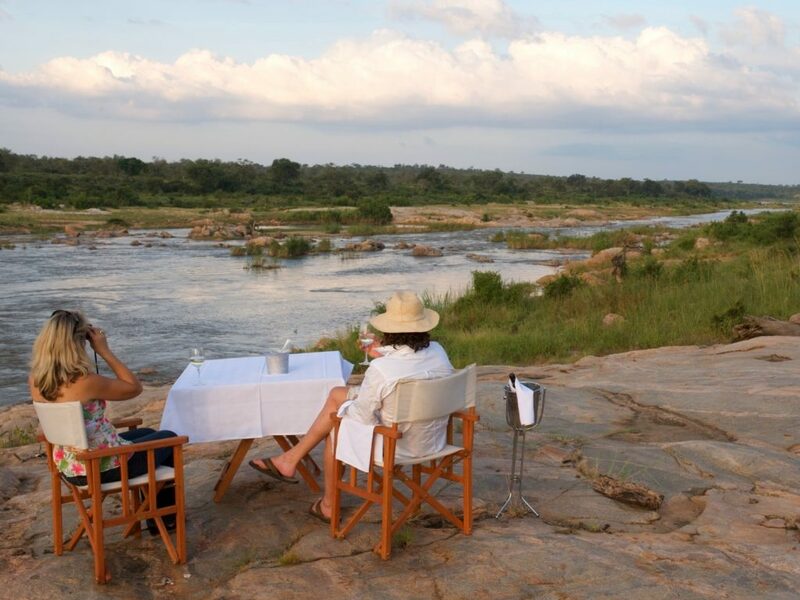 The highlight as stated previously though, has to be the lodge’s stunning location overlooking the Crocodile River. In fact, the Mjejane reserve boasts some eleven kilometres of prime riverfront frontage which both serves to attract animals as well as providing scenic beauty. Better still, at Mjejane you don’t even have to leave the lodge to see the game. Daily visits by huge herds of elephants (and all their cheeky, playful babies!) to the riverfront for a drink and a splash are very common – and sometimes the resident family of warthog will trot right up to the pool to drink and munch on the lush green lawns. 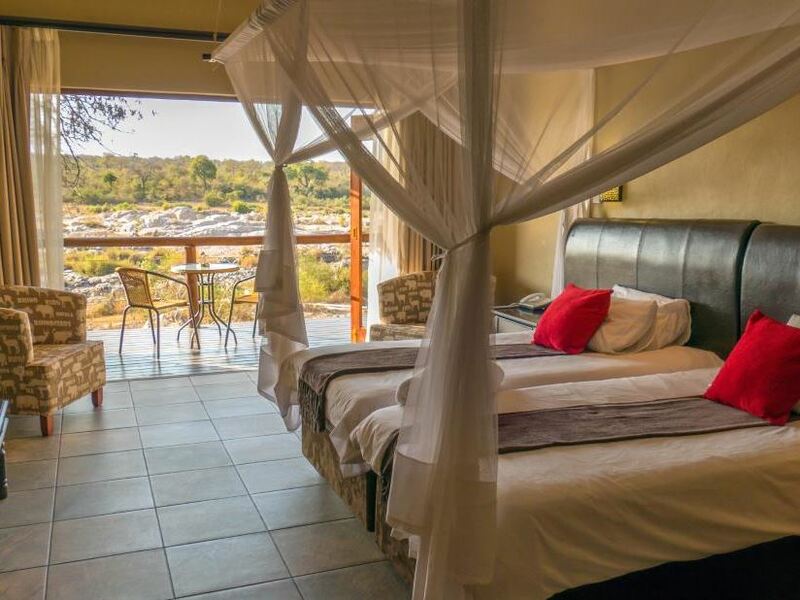 There are 2 room types on offer at Mjejane – the older Standard Rooms housed in the main lodge building, as well as Luxury Rooms which have been more recently built in stand-alone units away from the public areas and with prime river views. Frankly the Luxury Rooms are the ones we would go for, particularly given they’re only a little more expensive, as they really are very attractive indeed! Darker tones of rich earthy browns and red-stained polished concrete flooring work well with the burnished hard wood finishes and furniture in the bedrooms, while softer tones of grey and off-white of the couches and stone-inlay of the lounge impart a distinct relaxed feel. Bits and pieces of vivid colour – bursts of red and brown from the scatter cushions and art pieces – bring a liveliness and warmth. Rooms are stocked with all the bare essentials that you could want: tea, coffee, fridge, hairdryer, and insect repellent to keep bothersome mozzies at bay, as well as full air-con (a welcome relief, we must say – summer can bring high thirties temperatures with humidity too, so having that cool escape is just wonderful). Talking of cool escapes, you’re likely to spend plenty of time in the lodge’s swimming pool located on the grassy bank right above the river. An interesting feature of the pool is a wide shelf of ankle deep water where some chairs and tables have been placed, so you can relax and cool off sitting with a long cold drink with your feet in the water whilst you watch the ellies come down to drink and cavort in the river just below you! After sundowners on your game drive (often at a picturesque spot on the river banks!) you’ll return to the lodge for dinner. 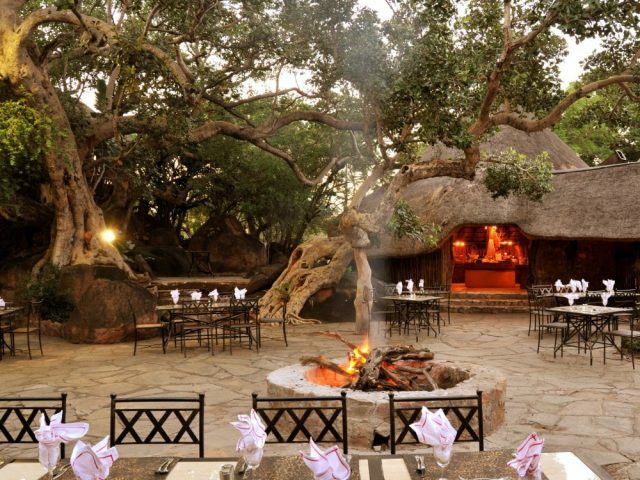 Mjejane does have an outside boma area for dining under the stars and this is probably the most traditionally “game lodgey” aspect of the lodge. It’s probably fair to say that the food and service doesn’t have the polish and quality of the much more expensive private lodges, but the comparison is hardly fair given the disparity in prices. Staff are friendly, the food decent, and when one considers the price the value on offer at Mjejane is undeniable. In short, Mjejane is a reliable option that brings a great location, decent service and excellent affordability together into one neat, simple package. It might not be lost in the depths of the bush or the heartlands of the largest reserves, but its easy access to the Kruger and lack of fences between the 2 reserves mean that its game-viewing opportunities can really delight. Come to think of it, the fact that this is a residential private reserve makes total sense: after all, who wouldn’t want to live in such a remarkably beautiful place?